I often get emails from friends, acquaintances, and the long lost uncle who told your grandmother at the last family reunion that he was writing a novel asking me about self-publishing. Should I do it? Is it for me? Will I forever be blackballed from traditional publishers? In short, maybe, maybe, and no. How’s that for ambiguity? However, when authors make the decision to self-publish, they make one of two (if not, both) fatal mistakes: A bad cover and a drab title. We’ll save the title talk for another day, but let’s address the cover issue. People who choose to self-publish usually aren’t flush with cash. So, they’re trying to cut every corner to get a somewhat quality book without paying for it. The problem is, you can’t have it both ways. Quality gets that way because someone took the time to develop and think through the best way to produce something of value. This is where your graphic designer comes in. Now, as tempting as it might be to use that cousin of yours who once purchased a version of Photoshop on eBay and cut out a picture of you to make it look like you were surfing in Hawaii, don’t. In fact, don’t even tell your relatives in the design world that you need a cover unless you’re asking them to recommend a good designer to you. Last night I opened the mail and received a catalog from a Christian self-publishing company with more than 400 new releases. It pained me to flip through it. I thought about all these men and women who had decided to take the all-inclusive package as a “better value”, which included a cover that looked like a monkey did it on CorelDRAW in five minutes. But the impending result is sales to 50 friends and family, if that, and no more. No unrelated reader is going to buy a book with just a cover on the candle or someone jumping in their air and touching their toes. Sorry, it’s not happening. 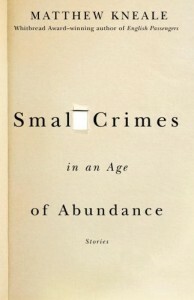 I won’t mock anyone and make them feel bad because of their poorly designed cover; those are a dime a dozen. But really good covers take work and smart thinking. 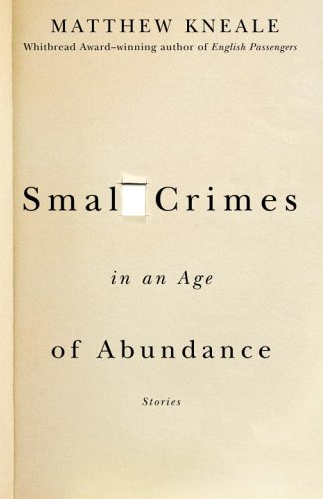 The cover for Matthew Kneale’s “Small Crimes in an Age of Abundance” is one of my favorites and is featured above. It’s beyond genius and I love it. It’s one of those ideas that I wish I had thought of — if that proposal had come across my desk. In conclusion, if you’re going to go through all the trouble of self-publishing, don’t waste your time (and needlessly killing trees) by skimping on a cover designer. You can get a serviceable cover designed for $300-$500. You can get a jaw-dropping cover designed for $750-$1,000. You can’t judge a book by it’s cover, but people always do. So, get over that cliche that makes undiscovered authors with awful covers and titles feel better about themselves and take control of your self-publishing future. At least give yourself a fighting chance that someone outside of your friends and family might want to give your book a read because it has a well-designed cover.